The people who make these shirts are paid $0.12 per hour. Now, this particular example is from Bangladesh; some countries, like China, have wages that are much higher – double, even – at $0.24 an hour, or more! And they get the privilege of working 10-14 hours per day, for a whopping monthly income that gets as high as… $250. PER MONTH. For working crazy long hours in crowded factories with major air and noise pollution. And then there are the folks who make the fabric (see below about what that means) who are spending their days inhaling all kinds of chemicals for the same great pay in similarly horrifying places. Because when you are expected to meet a quota, it is all about SPEED. So the stitch length is longer, which means it’s more likely to come loose while you’re wearing or washing it. I’m sure you all have as many shirts as I do with hems that are pulling out? …and to keep the prices low, they use the cheapest material around – PETROLEUM. Ahem, I mean Polyester. So it’s great for the environment. Did you know that polyester is made from petroleum and coal? And, in order to produce it, you start with an acid and alcohol chemical reaction to make a melted plastic puddle, which is stretched into ribbons and dried. And then cut into chips and dried some more. And then melted again and forced through tiny holes to form strands which can be knit or woven into fabric. Also, because it’s made of plastic, it doesn’t breathe when you wear it. So when you get hot and sweat, the heat and moisture are trapped between the garment and your body, making it more prone to permanent odors and pit stains and you more prone to discomfort while wearing it. And if you’re cold, it forms a barrier between your skin and whatever heat source you may use to try to warm up. Natural fibers (cotton, linen, silk, hemp) on the other hand are breathable – meaning heat and moisture can escape when you get warm, and can get in when you are cold. WHAT IF CRAFTY BROADS MADE THIS SHIRT? You could extrapolate with some assumptions – perhaps a US factory with special equipment could make it in just one hour, and paying at least minimum wage* (currently $8.25 in Illinois) could perhaps reduce the labor to $25 or so, including its overhead and markup. And with economies of scale, the material cost could probably be reduced by a dollar or two, bringing the wholesale cost to around $33. If we assume the same 60% markup by the retailer, that would bring the total to $52.80. *We’d argue that sewing is skilled labor, and should be compensated at a higher rate because it can’t be done by just anyone. Furthermore, the minimum wage is not really a living wage and desperately needs… a raise. 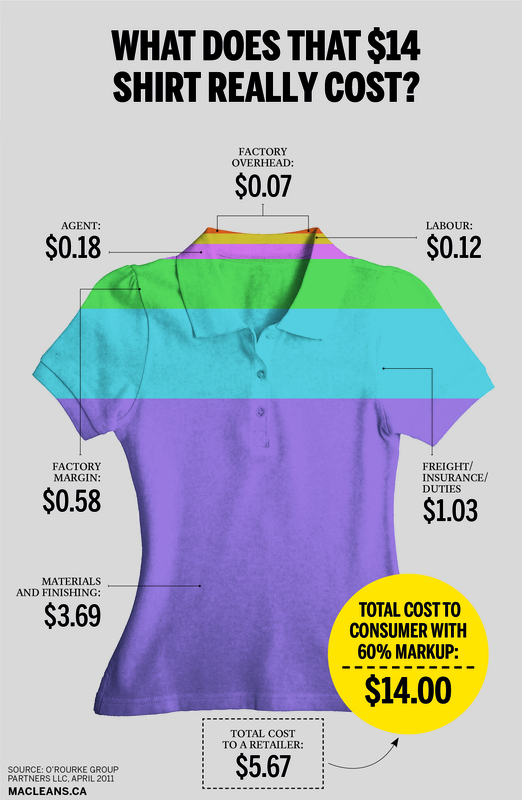 So… in summary, yes, it would cost quite a bit more than we are used to paying to have ethically made clothing. It would mean a return to a time when we bought a much lower volume of much better quality garments. It would mean that we’d wear the same clothing over and over, instead of having a new outfit for every day of the month. It would mean taking better care of our clothes – using gentler cycles, hang-drying more things, and even hand washing from time to time. What do you think? Is it worth the higher price to have ethically made, better quality garments? Will you start making that change in your wardrobe? Here’s another throwback post for you – this couple will be celebrating their 2nd anniversary in just a few weeks!! Holly and Dan found us through A Practical Wedding. They were living in San Francisco and planning a wedding in Indianapolis, and wisely decided to get some help pulling everything together! This is Holly’s grandmother’s house. It is unbelievably beautiful. Of course they leapt at the opportunity to use it at the backdrop for their wedding! Aside from its obvious charm, this house is a place where the two of them had spent many, many days together so it holds a special place in their hearts. They decided to fully embrace the era of the home, using vintage colored glass goblets at their place settings and retro cotton prints for the napkins and table linens. Each table had a different print, and Holly sewed all of the linens herself. And my favorite thing? The seating assignments! Holly made magnets using the same fabrics as the tablecloths and napkins and used them to hold up polaroids of each guest; they found their table by matching the magnet to the tablecloth. What fun! After a lovely ceremony in the side yard, everyone moved through the historic home for cocktail hour, and then into a tent in the backyard for the reception. Though they’d loaded an iPod with music for the night, it ended up mostly collecting dust – Holly’s Uncle and his band were expected to play for an hour or two, but they honored the crowd’s request to go all night long! Congratulations and Happy Anniversary, Holly & Dan! All photos were taken by Eric Rudd Photography and are reposted here the photographer’s permission. Photos in this and all posts are protected by copyright, and are not available for reproduction, redistribution, or any other purpose without written authorization from the photographer. Louise came to us looking for something unique and a little bit funky that would nevertheless say “This is the bride!” She wanted something tea-length with a full-skirt and sleeves – and she didn’t want it to be white. That would be a pretty tall order in your average bridal shop, which is why she came to us! One idea for Louise – a custom-designed print! A second option for Louise – ivory lace over a sunny yellow silk! An artist and crafter herself, she was excited to collaborate with us to create something new and special – and so were we. We came up with a couple ideas for her, including the option of designing our own printed fabric for the dress! When we met to go over the designs, she came with her own sketch too, and between the three of us, we settled on a yellow dress with a full lace overlay. We tried a new technique with the mockup and lining on this dress and it proved to be much more effort than it was worth. So, although it turned out well in the end, we will not be repeating that one. Lace always has its own challenges – since it can be quite expensive, we wanted to get the fit absolutely perfect before buying or cutting it. Louise was a great sport through several fittings as we made sure everything was in its proper place, and that those tricky sleeves fit just right! …then we adjusted the layout of the scallop edge by hand. Somewhere along the way, the groom got so jealous of the custom garment process that he decided to go out and have a custom suit made for himself too!! During one of our later fittings, Louise asked us to incorporate some material from her grandmother’s wedding gown into her dress somehow, and left us free reign as to how exactly that should be accomplished. We’d been talking about her hand-crafted wedding details, and she showed us a photo of the custom silk screen she’d made for her welcome bags – an outline of the state of Illinois with their names and wedding date in the middle. We decided to mirror that with an embroidered version (in blue thread, for that ubiquitous “something”) inside the lining of her skirt. We all got pretty emotional at the reveal. We were also able to incorporate some of her grandmother’s dress as the ivory leaves behind the flower on her custom birdcage veil; along with her yellow dress, she planned to wear teal shoes and this headpiece brings all those colors together. As is often the case, we were glad to have finished this project, but also rather sad to see it leave our shop. In the end, though, we were so happy to see Louise beaming as she wore it on her wedding day! Congratulations Louise & Michael! It was truly our pleasure making this dress with you!! Photos in this and all posts are protected by copyright, and are used with permission. They are not available for reposting or any other purpose without written authorization from the photographer. On Friday morning, we awoke to the very exciting news that we’d been named to Yelp‘s list of the Top 10 Wedding Planners in Chicago! We pride ourselves on excellent customer service, and we’re always happy to read reviews that tell us we are doing well, but it is amazing to be recognized like this in a city full of so many wonderful wedding vendors!! This photo was from a recent wedding with a Pixar theme – so much fun! Julia got to be the remote control operator for WALL-E, the ring bearer, who rolled up the aisle and danced at the front! We’d like to give a shout out to our clients – getting to know you and be a part of your big life moments is so amazing, and it’s why we do this job! We absolutely love meeting each of you, hearing all about your lives and your plans, and we sure like to think we are friends at the end of it! So THANK YOU!! Jacket to wear over (completed!) corset – I have blueish purple silk dupioni for this, and superb inspiration for the style. UPDATE: Not even remotely started. Continue to think about it from time to time, mainly when I open the fabric cabinet and drool over dupioni. Alterations to a dress I made a few years ago but now hate, to turn it into a simple skirt (with pockets!) to complete the above ensemble. UPDATE: I have actually spent about five minutes thinking about this one – does that count? Pretty much decided not to ever do this. Would rather start from scratch and make a new skirt because I just know so much more about all relevant sewing techniques now. However, may still do this only because I will never find this fabric again and I love it. Corset for Julia that she has been begging me to make for the last two years. UPDATE: Uh uh. Not done. Reasonably certain I have not even thought about it since I posted the last update… sorry love! New pajama pants. Mine all have holes. (Lots of them, in unfortunate places.) I have awesome Flinstones-esque dark teal with black tiger stripe fabric. They will be so much fun to wear. UPDATE: Not at all done. But the growing number and size of holes in my pajama pants has moved this to the top of the priority list. DONE DONE DONE DONE DONE! Aren’t they amazing/terrible?? I love them. I have a whole coordinating pajama outfit now. The aforementioned Great T-Shirt Project of 2010. You guys, in 2010 we bought 30 pounds of jersey so that we could both expand our sad, sad collection of ill-fitting t-shirts. (I have a long torso, so basically every t-shirt ever manufactured shows an inch or two of stomach, which I’d prefer stayed out of sight and warm.) UPDATE: Let’s jut admit there is no way this will happen before 2013 2014. I have silky, stretchy, clingy, shiny teal fabric for a drape-y dress shirt. UPDATE: I still have it! It’s still folded neatly among all the other pretty things in our fabric stash… untouched. I am determined to never purchase jeans again and start making my own, because there are no pants in the universe that fit me properly. (And the ones I have are dangerously close to being to worn to wear in public.) UPDATE: I still believe this firmly. It may even happen soon-ish. SO DONE! And working on a second pair! And on patterns, generally, so custom jeans can be offered to YOU! Pictures will be forthcoming when I write a whole post about them! On that note, I need some dressier-than-jeans but not as fancy as wedding attire to wear to my clients’ rehearsals. As well as some more wedding attire to wear to their weddings. I know I’m getting sick of my same two outfits, and if you started looking at photos of me on fancy occasions, you’d be sick of them too. UPDATE: Zero progress. I have bought some fabrics and imagined some ideas. I also have two pairs of corduroy pants in progress that need finishing. UPDATE: These remain untouched, but now that I have a functional jeans pattern, there is a decent chance of the pair I didn’t start cutting yet getting made soon. And cranberry corduroy for a winter skirt. UPDATE: I thought about it last week because fall is here and this would be a great time to wear it. You know, if it had been designed/sewn already. I did this a while ago! Maybe a year? And I have been wearing it all the time. I will probably make another one or two in different fabrics. Make my own swimsuit for the summer! (Long torso is a big problem in this department as well.) UPDATE: Maybe next this year. And there you have it. I have crossed one personal project off the list since May, and that pretty much only happened because I had a really good deadline. Shauna and Mike had a great plan for a fun and casual wedding – head to an Irish pub, get hitched the beer garden, spend the evening alternating breaks on the grass with spins on the dance floor. After all, what is a summer night in Chicago, if not spent on a patio seat with a cold brew in hand? Sometimes, the weather does not quite cooperate with our delightfully imagined plans. It rained in the early afternoon. As we were setting up chairs outside, the clouds gathered and threatened to unleash a torrent. Shortly before the ceremony was set to begin, the downpour started. And that is why we make back up plans! Shauna and Mike, along with their guests, were great sports as we quickly rearranged the schedule, moving everyone into the pub for a pre-ceremony cocktail hour. That gave the rain enough time to stop (almost as soon as it had started), and gave us enough time to quickly towel dry the chairs. The ceremony, though slightly delayed, was absolutely lovely, with a stunning couple and some gorgeous post-rain light. Shauna wore her mother’s wedding dress, which she’d had restyled to better suit her tastes, for the ceremony. We really love it when heirlooms can be passed down and re-imagined this way! And rather than the traditional wedding party, these two chose to have their families walk down the aisle instead. Thankfully, that was the end of the precipitation, and guests were able to enjoy the beer garden for the duration! Congratulations Shauna & Mike! All photos were taken by Emilia Jane Photography and are reposted here the photographer’s permission. Photos in this and all posts are protected by copyright, and are not available for reproduction, redistribution, or any other purpose without written authorization from the photographer. Thanks for joining us at the Finally Forever Wedding Expo! Congratulations to Samuel Green! He and his future spouse have won their choice of a Budget Strategy Session, registration for two to our Wedding Planning 101 Workshop, or having the design fee waived on a Custom Wedding Garment. They’ve also won free admission to The Planning Party on April 1st. We had a wonderful time meeting all of you, and we hope you got some great ideas and resources to plan a fantastic wedding! Don’t forget about our Marriage Equality Discount, valid for all wedding planning services booked by March 31st for weddings taking place in 2014. What is this Planning Party thing? If you are stressed out with wedding planning and you need a little bit of expert help and/or a big glass of wine, then it might be just the party for you! The Planning Party is a casual get together where couples are invited to ask us absolutely anything about planning their weddings. We’ll be featuring a different vendor each month to talk about their specialty and answer questions as well. At our inaugural Party on Tuesday April 1st, our guest will be Emilia Schobeiri of Emilia Jane Photography. (You may remember her lovely photos of Sarah’s wedding dress and winter coat or James and Liz’s wedding.) And, of course, refreshments will be provided. Follow the link above to register or get more information. When you’re over 6′ tall, it can be pretty difficult to find anything that fits off the rack. If you’re on the hunt for a wedding gown, you’d like to have straps, you don’t want a pouffy princess ballgown, and you don’t even want it to be white, it’s damn near impossible. And that’s why Kate came to see us. She was looking for something classy and fitted through the torso with a trumpet flare at the bottom. She wanted her dress to have lots of texture to it. Of the design options we presented, Kate’s top choice was our “starburst” design, featuring seamed panels of fabric angling outwards in all directions from a central point of the dress. We often use padding to make a dress form into the same shape as a client so that we can drape our design on it; however there are some limitations. While you can add material to make a dress form wider, there’s no good way to make one taller in any area except the legs. And though many tall people are tall because they have super long legs, Kate is tall in every aspect – long legs, long torso, she is even long from shoulder to bustline. So for this project we chose to use a flat-patterning method – taking Kate’s exact measurements and using a computer and a lot of very specific math to create a paper patter that we could work from. It worked out very well and needed surprisingly little adjustment at our mockup fitting. We selected silk dupioni for the seamed portion of the dress from the knees up, and a 4-ply silk crepe to create a flowing skirt on the bottom, both in a blushy pink shade. This was our first time working with the silk crepe, and it was delightful to cut and sew. It has a nice medium weight to it, which made the whole garment hang nicely. The seamed dupioni portion of the dress created a lot of visual texture, and turned out beautifully! Photo © Glass Lilac Photography. Photos in this and all posts are protected by copyright, and are reposted here with the photographer’s permission. They are not available for reproduction, redistribution, or any other purpose without written authorization from the photographer. Join us at the Finally Forever wedding expo! We are thrilled that marriage equality has finally come to Illinois, and even more so that a recent ruling has put the new law into immediate effect. Please join us in celebrating and get started planning your wedding at the Finally Forever wedding show this Sunday, March 9th! The Chicago Area Gay and Lesbian Chamber of Commerce is bringing together all kinds of vendors, including us, to help you get started on planning your big day. DJs will be spinning, caterers will be giving out samples, and we’re told the wine will be flowing! Over at the Crafty Broads table, we’ll be giving away a free budget strategy session to one lucky couple – so stop by and chat with us! This event is FREE and open to ALL couples, because equality is for everyone. Click here to register.